The most important thing for playing windshifts is finding the median, or average, wind direction. This is typically the direction that�s half way between the farthest left shift and the farthest right shift you�ve seen. Since you can�t go head to wind (to find the wind direction) while you�re racing, what you really need are your close-hauled median headings. These are the compass courses you steer on port and starboard tack when the wind is at its median. During the course of a race, the average wind direction might shift slightly to the left or right. Make sure you keep an eye on this, and don�t be afraid to adjust your median numbers accordingly. Once you�ve determined the median headings, you will always know whether you are lifted (sailing higher than the median) or headed (sailing lower than the median). If you are sailing below your median, you should normally tack. By tacking on the header you will have a lift on the other tack. In my opinion, it�s more important (and easier) to know the range of the oscillations than their timing. However, there are two situations on the first beat where it can be helpful to know about timing, too. One is at the start when you�re trying to figure out how soon the first shift will come. Another is near the windward mark when you need to know if the wind will shift again before you get there. If you are close enough to the windward mark that the wind will not shift again on this leg, you probably shouldn�t tack on the header like you would normally do. Instead, treat the last oscillation as if it is a persistent shift (because it will not oscillate again on this beat). Keep sailing into the header until you are able to tack and fetch the mark. In most situations you want to avoid sailing in bad air at almost any cost. Wind shadows make you go slower and point lower. The longer you stay in them, the more you�ll lose to boats sailing in clear air. In oscillating winds, however, it might not be a terrible idea to �live� in bad air sometimes. If you are on a lift, you might lose more by tacking off the lift than you would by sailing in bad air. This is especially true in moderate or heavy winds, when the slowing effect of wind shadows is not so great. When the wind is oscillating in direction, it is also likely to have variations in velocity (i.e. puffs and lulls) across the course. And sometimes you have a tough choice - either sail on a lift or sail toward a puff. Which is better? Your strategy will depend on several factors, but primarily on the overall wind velocity. If there is already a lot of breeze, a puff won�t make much difference, and you should probably go for the lift. But if the wind is light, a puff can give you a huge speed boost (and also a lift because you can sail higher in more breeze), so it may be worth sailing on a header to get there. 4 Keep a good lookout. An oscillating breeze changes all the time, so you really have to keep your head out of the boat in order to sail fast. One idea is to assign a crewmember to look for shifts. If there�s another fleet of racing boats to windward, these make great wind indicators. Watch other �telltales� such as smokestacks, flags on shore, flags on stake or committee boats, the swing of anchored boats, and so on. Try to discover a pattern between the actions of these indicators and subsequent changes in the wind. The other boats in your fleet are also good telltales, especially if they split to opposite sides of the course. And whenever you cross close to another boat, keep an eye on them the next time you come together to see if you have gained or lost. When the wind is oscillating, it usually works to play the middle of the course (one exception is light air and large fleets when the sides usually seem to pay). 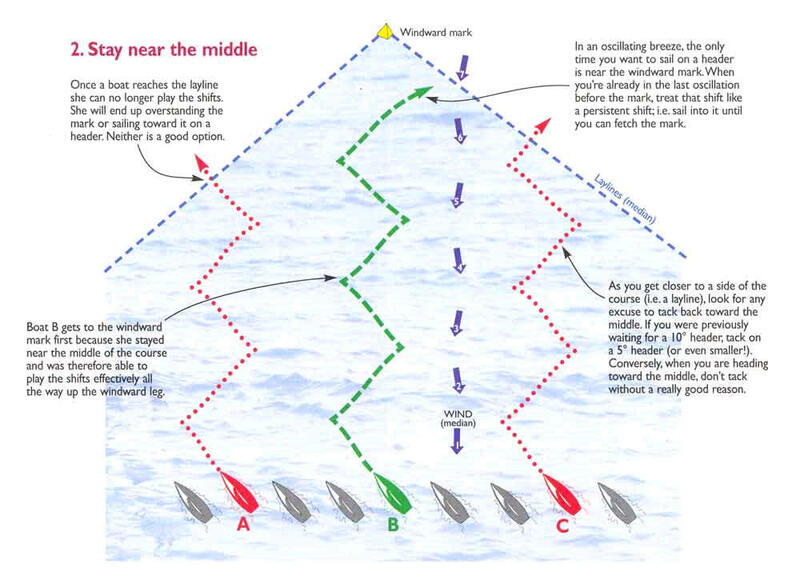 If you are sailing away from the middle, look for good reasons to tack; when you are sailing toward the middle, don�t tack unless you have a very good reason (see the diagram above). This strategy keeps you away from the laylines, which are deadends in a shifty breeze. By staying near the middle, you should be able to take full advantage of every shift up to the windward mark. When you see a boat nearby on a huge lift, it is tempting to sail toward that shift and try to get it. However, this rarely works. More often than not, you must sail on a header to reach the other boat. And when you get there, the shift is usually gone. You will probably be more successful if you focus on sailing in the wind you have. Use other boats as a guide to know how much you are lifted or headed, but don�t try to sail for their shift (unless it�s light air and you�re going for pressure). It�s very difficult to �cover� other boats when the wind is oscillating. 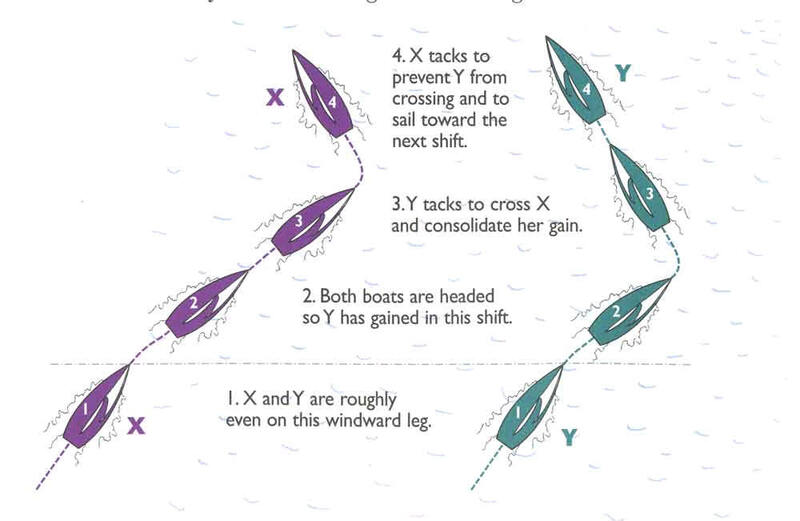 By covering, I mean staying upwind of the other boat, or between them and the windward mark. If you try this in an oscillating breeze, however, you are likely to lose. That�s because if the boat you are covering is playing the shifts correctly, you won�t be (since you are almost always in a different part of the oscillation than they are). In shifty winds, your main priority is to sail your own race - then worry about other boats. If you are sailing on a lift (and you should almost always be sailing on a lift when the wind is oscillating! ), you should sail just slightly lower and faster than normal (assuming you will get at least one more oscillation on the beat). This will get you to the next shift sooner and maximize your VMG in the direction of the median wind. If the value of your stocks goes up, you won�t realize an increase in wealth unless you sell those stocks before they go back down. Playing windshifts is very similar. If you get headed you will gain on all the boats to windward and behind. But you won�t be ahead until you tack and cross them.